Edge have announced that they are retiring a number of sculptures and colour variations which means that they will no longer produce them. This mainly includes selected colours of Barn Owls, Bull Terriers, Heraldic Dragons, Hannya Masks, Spartan, T-Rex, Venetian Masks and Wood Elfs. Essentially if the sculpture and/or colour variation is not shown on our website then it is no longer available. 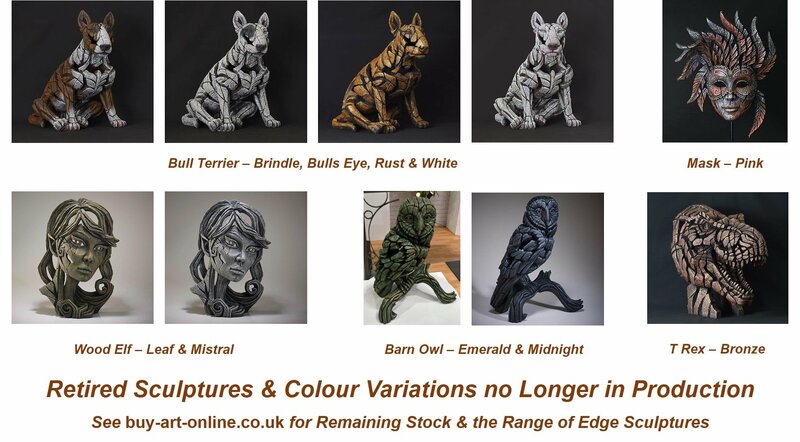 We do however have a very limited number of the retired sculptures and colours shown below currently in stock. Be quick if you would like one ! !